Last night the Real Housewives Of Atlanta celebrated their 10 year anniversary by counting down their top ten moments. I cannot believe that I’ve had NeNe Leakes in my life longer than I’ve had my children in my life, but the Bravo universe is vast and all-encompassing! I was expecting the Real Housewives themselves to weigh in on all the past drama and spill some behind-the-scenes secrets, similar to when other cities have done an anniversary. I was also expecting to get catch-ups from retired cast members like DeShawn Snow or Kim Fields, but instead we were just handed a ton of flashback footage to reminisce over. There were weddings, breakdowns (often those two things combined), walk-offs, shade wars, and vintage footage of Wigs with her Cigs. You have to give Kim Zolciak some props. She didn’t even attend the Real Housewives of Atlanta trip to Barcelona, there were three women on the trip who aren’t even cast members, yet she was still the focus of the last episode. She more than earned her Friend of the Housewives paycheck, the spotlight is on her, and she got to achieve both of those things back in Atlanta while she chilled with her man and kids. Kim stole the show when she sent that brutal group text to the entire group with photos of NeNe Leakes’ car parked in a handicap parking space and a video from NeNe’s bathroom with roaches running around. Real Housewives of Atlanta star Sheree Whitfield continues to open up about her court case drama with costar Phaedra Parks! After Phaedra agreed to represent Sheree in her child support case with ex-husband Bob Whitfield, the ladies eventually decided to end their professional relationship amicably as Sheree felt Phaedra was outsmarted by her ex in court. Many felt Sheree was ungrateful as there was nothing Phaedra could have done to prevent her ex from filing an order of contempt against her. During her appearance on the Watch What Happens Live Aftershow on Sunday night, Sheree went into more details about why she felt Phaedra didn’t represent her well. Sheree’s defense is that Phaedra volunteered to file a contempt motion on her behalf (didn’t she tell Phaedra NOT to file??? ), but Bob beat her to the punch two weeks later because Phaedra was waiting to get clearance for Bravo cameras. “I never met with Phaedra outside of your cameras. So to me when I’m meeting with her, and I’m saying this is my life. Like even if the cameras are not there, what you’re supposed to do, I still need you to do it,” said Sheree. Sheree also talked about Phaedra’s employees hounding her to get the retainer. “I love Phaedra. I didn’t want to end it in a bad way but it didn’t sit well with me when it kind of made it seem like they were hounding me, asking me, trying to get this money when that is not the case. When Phaedra asked me for the money, it was the day before… She had her people call me… I get a phone call. They’re like we need the money. I never got a contract. I never got any kind of paper work,” said Sheree. DOES SHEREE OWE HER EX BOB WHITFIELD OVER $400,000? “The money part came in after Bob filed because it takes it to a whole other level. Before it was something very simple when she volunteered to file the contempt but she never did it because the cameras couldn’t get to her in time,” continued Sheree. Sheree adds that by the time they went to court a month later, Phaedra had still yet to file anything. “The only time Phaedra and I met off camera was with another attorney who is a family attorney who was actually coaching her on how to handle my case,” added Sheree. And on the actual WWHL show, Sheree fired back at the criticism that she shouldn’t be suing for child support if she can afford expensive items such as a Hermes bag, designer clothes and a Porsche to replace her old seized Bentley. Meanwhile, Sheree also debuted her new song “Who Gon Check Me Boo” on WWHL. Some are calling it a diss track to her costar Nene Leakes though Sheree denies the allegations. We’ll let you be the judge! Below is Sheree’s song! In other RHOA news, former show extra cast member Dwight Eubanks was arrested yesterday. MyFoxAtlanta reports the arrest was made after a traffic stop where Dwight told the cop he didn’t have his driver’s license on him. The cop conducted a check and discovered Dwight’s license was suspended, after which Dwight was taken into custody. Dwight’s license suspension came about when he failed to appear in court for a previous unresolved matter. He has a court date set for February. TELL US – AFTER HEARING SHEREE’S SIDE, DO YOU THINK PHAEDRA REPRESENTED HER WELL? THOUGHTS ON SHEREE’S SONG & DWIGHT’S ARREST? CLICK THE CONTINUE READING BUTTON BELOW TO HEAR SHEREE’S SONG! Real Housewives of Atlanta’s original snazzy suit snazzy suit wearing hairdresser Dwight Eubanks has decided he is “absolutely not” returning to Real Housewives! Dwight explains remaining involved in the series is the dwrong thing to do given all the bitchy, backstabbing nonsense involved with the show! In a conversation with BET, Dwight explains: “It was very time-consuming and I only did the Real Housewives of Atlanta to promote [his Purple Door Salon] and out of three years, they have not yet shown what I really do. I’ve had a salon for over 25 years and they just refuse to show it. It does not make sense.” Interesting, considering Bravo (tirelessly) promotes all the other housewives’ ventures – and those of their husbands, boyfriends, families, etc. – while in Dwight’s case his role centers around his frienemy relationship with NeNeLeakes and his party planning skills! Oh, and his snarky comments – which are gold. Dwight isn’t done with reality TV however, since he apparently has a hair-centered reality show in the works: “They’re still trying to figure out what to do with me. You have to realize: I’m 50 years old. Therefore, it has to be something that makes sense and has substance.” Well, Dwight – you, your snark, and your over-the-top personality will definitely be missed! Who is going to ballroom dance with Phaedra now? As for his now former castmates, including real-life friend Phaedra, no one has mentioned Dwight’s departure on Twitter or Facebook. Although NeNe posted she is currently hosting The TVGuide Channel’s “Most Notorious Celebrity Feuds.” Well, that’s the perfect gig for her given she’s probably included in the list! Are you sad Dwight is leaving the show? Are you surprised? Would you watch a reality show about Dwight’s salon? Preview The Real Housewives of Atlanta Episode 4! Moves To Sunday Nights! An all new episode of the Real Housewives of Atlanta coming tonight! On the 4th episode this season, titled ‘Petty Boughetto,’ Cynthia and her boyfriend Peter join Phaedra and Dwight for a day at the Steeple Chase, but before they can even arrive, Cynthia and Peter are put on the spot on the future of their relationship. And it is a true down south, ladies-who-lunch celebration when the day of Phaedra’s baby shower finally arrives! But when some of the other ‘wives continue to chatter about Phaedra’s less-than-perfect father-to-be, will it spoil the special day? Also, former housewife Lisa Wu Hartwell makes a special appearance at Phaedra’s baby shower. We will also get to see Nene Leakes as she undergoes her nose job. The new episode airs tonight at 9/8c on Bravo. In other Atlanta news, Bravo announced today that starting November 7, the Real Housewives of Atlanta will move to Sunday nights at 10/9c. Watch What Happens Live will also be making the move to Sunday. No reason was given for the change in schedule. TELL US – WHAT ARE YOUR THOUGHTS ON TONIGHT’S EPISODE? Preview The Real Housewives of Atlanta! Plus Nene Furious With Gregg? An all new episode of the Real Housewives of Atlanta coming our way at 9/8c tonight on Bravo. On the third episode of the season, titled ‘White Hot,’ Kim receives the opportunity of a lifetime when she is invited to perform at one of the biggest gay circuit parties – the White Party. But only having “Tardy for the Party” under her repertoire, is Kim ready for her first concert appearance? Meanwhile NeNe continues to struggle with her son Brice’s brush with the law, and new housewife Phaedra continues to defend her husband Apollo and his shady, criminal past amidst rumors around town. But when it seems that Phaedra and Apollo don’t exactly see eye to eye when it comes to parenting, how will this affect their relationship? Find out tonight! In other Atlanta news, RadarOnline is reporting that Nene Leakes’ marriage to hubby Gregg Leakes continues to be strained. The latest is that Nene is very furious at Gregg all over the money he reportedly borrowed from Dwight Eubanks. Tonight is the night! That is the night the Real Housewives of Atlanta return for their long awaited 3rd season. So what can we expect tonight? One word – DRAMA! Unlike the New Jersey Housewives’ second season, which we had to wait almost 9 episodes before the infamous country club scene, the Atlanta ladies bring the drama on the season premiere! Nene Leakes and Dwight Eubanks will almost come to blows tonight as Nene decides to confront Dwight on rumors he has been spreading about her husband Gregg. Rumors which include Gregg trying to borrow money from him. Meanwhile, the other housewives read about Kim Zolciak’s article in Life&Style magazine, during which she comes out as a bisexual, and they all try to get the scoop on the real deal with Kim. Sheree Whitfield decides she now wants to act following the failure demise of her She By Sheree fashion line. Kandi Burruss tries to get back into the dating scene following the tragic death of her fiance last year. One of the new housewives, Phaedra Parks will also be introduced in tonight’s episode. In other Atlanta news, new housewife Phaedra Parks has found herself in the media headlines since the February announcement of her addition to the show. The reason? The Atlanta Entertainment Attorney just happens to be married to an ex-con named Apollo Nida. Apollo, 31, was convicted in 2004 for racketeering. He was paroled last year in May 2009 after serving five out of his 18-year prison sentence. Phaedra and Apollo married late last year and the two recently welcomed a baby boy in July. My husband was convicted of a white-collar crime. It was racketeering. He comes up for an appeal and we just hope that works out positively. But he wasn’t guilty of harming any person or anybody and unfortunately that’s what happened. I married my husband because I loved him and he loved me and I think that’s the foundation of any good relationship. I didn’t marry him because of his past or because of his future. I married him because I respected him and I realized⎯everyone should realize that people make mistakes. I know who I am and I have a very good sense of my husband and what our relationship is built on. So at the end of the day I have to go home to him and so whomever you marry has to be your personal choice. And that has to be a choice that you’re willing to live with. I married him because I love him, not because somebody else loves him and has to live with him and deal with him every day⎯it’s because I do so if you can live with your decision then that’s all that matters. UPDATE – Apollo’s mugshots have been added below. TELL US – WHAT ARE YOUR THOUGHTS ON TONIGHT’S SEASON PREMIERE? PLUS PHAEDRA’S DECISION TO MARRY AN EX-CON? Video: Preview The Real Housewives of Atlanta Season 3 Trailer! If you thought the second season of the Real Housewives of Atlanta was dramatic, then buckle up for the ride as the season three trailer brings even more drama! 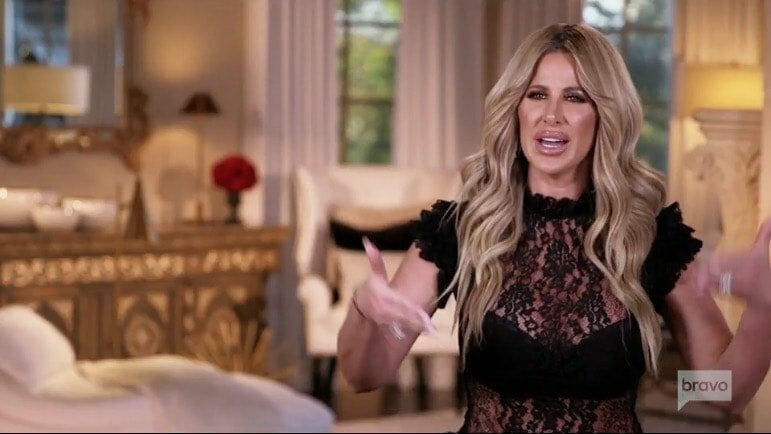 In the two minute preview clip released by Bravo, we see Nene Leakes telling off her husband Gregg Leakes, while on a different occasion, Kim Zolicak and yet again Nene, get into a shouting match during an argument in what looks to be the back of a tour bus. 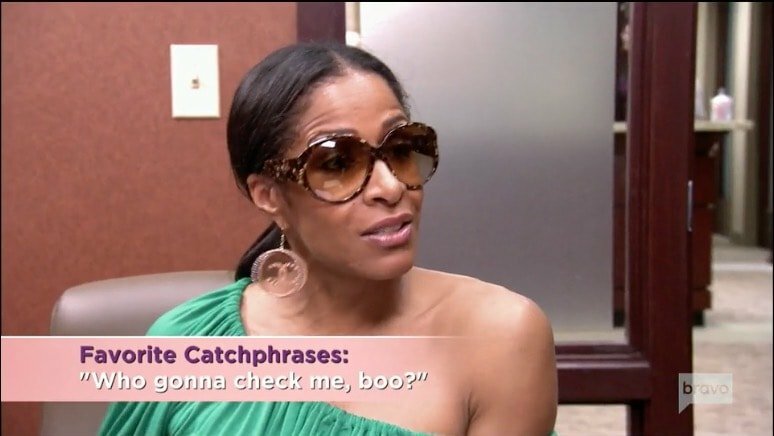 We also see Kim admitting to her lesbian relationship, and we get to see Sheree’s Whitfield’s eldest daughter make an appearance. One of the new housewives, Phaedra Parks, will also get into some tiffs regarding her marriage to an ex-con. CLICK HERE TO SEE THE SEASON 3 CAST PHOTOS! Judging from the video preview, this season will not disappoint. Missing from the video trailer? Lisa Wu Hartwell, who will reportedly make guest appearances on the show a la Dwight Eubanks. TELL US – WHAT ARE YOUR THOUGHTS ON THE VIDEO PREVIEW?